On Febrary 13th Growing Home was recognized at the 19th Annual Chicago Neighborhood Development Awards® for its dedicated work in community development. It’s no secret that the Englewood neighborhood has suffered from serious disinvestment and population loss in recent years. And for untrained eyes and ears, few would link Englewood with the word “innovation.” But at the flourishing Wood Street Urban Farm, Englewood residents plant, grow, harvest and shop for produce. They also learn about organic farming and take part in job training programs. Growing Home is a social enterprise committed to community development through urban farming. Teamwork Englewood approached the organization to help meet a critical community need – access to fresh food and healthier life choices. The organization expanded its vision to include job training, physical activity and employment assistance to a neighborhood that has high rates of obesity and unemployment. Since winning permission from the city to use the Wood Street lot as a garden, Growing Home has transformed that open space into a two-thirds-acre garden, complete with a building that houses classrooms, office space, and a vegetable processing area. Though small, in 2012 the farm produced nearly 13,000 pounds of produce, generating $200,000 in revenue. 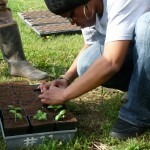 In addition to creating a weekly farm stand and holding cooking classes for youth and adults, Growing Home has established a micro-center of economic development with its transitional jobs program, offering training, internships and employment services, which has placed Englewood residents in more than 200 jobs. For inspiring healthy living, community empowerment, and economic development in Englewood, Growing Home is this year’s winner of The Chicago Community Trust Outstanding Community Strategy of the Year Award.